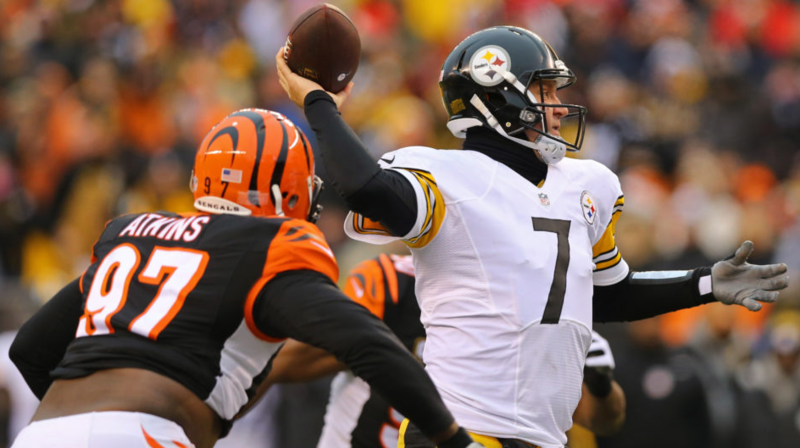 Big Ben remains one of the best quarterbacks in football. Although Roethlisberger is prone to a few poor games a year, the Pittsburgh legend is still a top-10 QB. 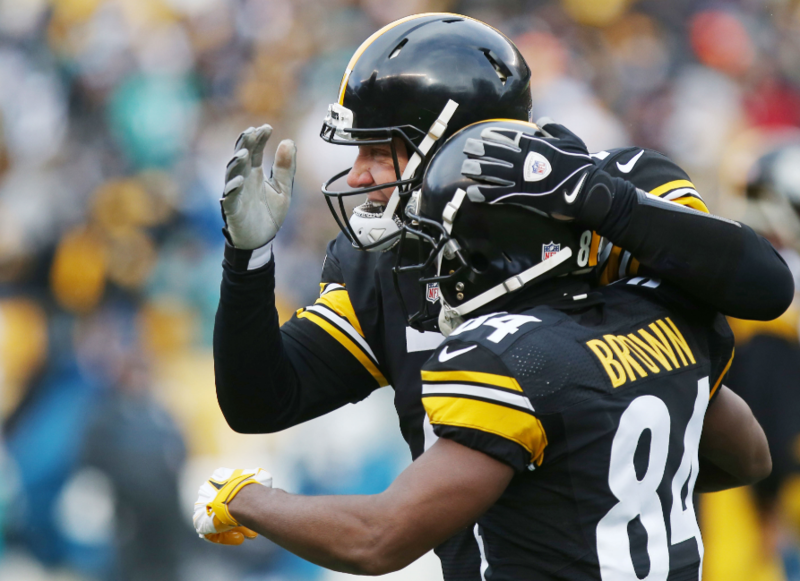 Having a receiver like Antonio Brown on his side will only prolong Roethlisberger’s career. Big Ben is a winner — evidenced by leading the Steelers to double-digit wins in each season since 2014. 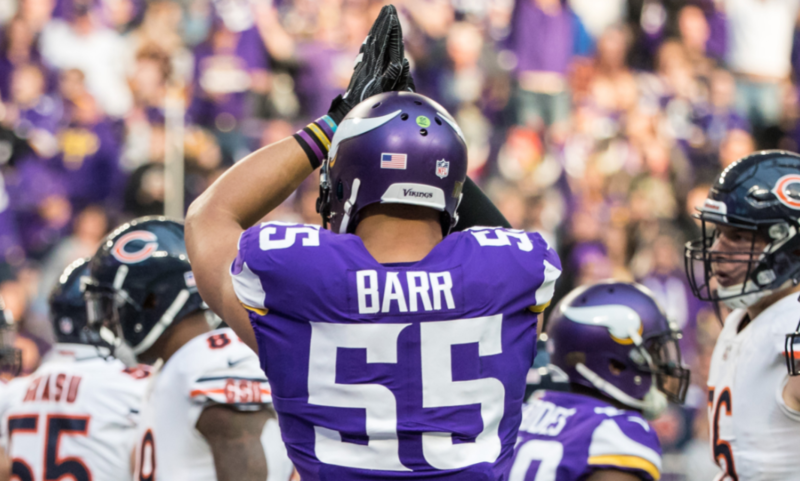 A main cog in Minnesota’s elite defense, Barr is one of the best outside linebackers in football. The three-time Pro Bowler may have become the Packers No. 1 enemy for breaking Aaron Rodgers’ collarbone, but Minnesota fans adore the punishing defender. Barr will remain a force to be reckoned with for years to come. 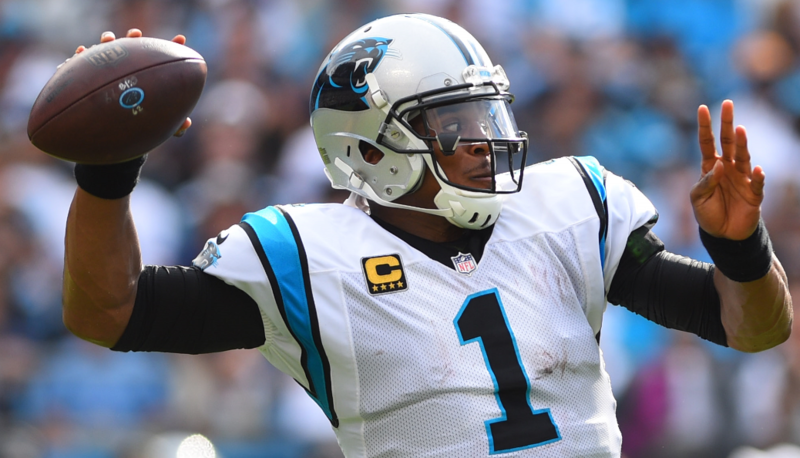 A former MVP, Newton often gets criticized for his accuracy in the passing game. While ‘Superman’ has certainly had his struggles through the air, there is no denying he is one of the best players in the game. Newton is arguably one of the hardest players to defend against. Not only can he beat you with his arm, but Newton is especially effective when worked into the rushing attack. Newton has the most rushing TDs by a quarterback in NFL history, and leads all QBs in rushing since 2011. There is an argument to be made that Ertz is the second-best tight end in the NFL. Already the greatest TE in Philadelphia history, Ertz plays more like a receiver than a true tight end. Ertz is coming off a year in which he set a career-high in touchdowns. He also hauled in the game-winning score in last year’s Super Bowl victory. Only 28 years of age, Ertz has plenty of time to overtake Rob Gronkowski as the league’s best tight end. Peters established himself as the NFL’s premier ball-hawk during his Kansas City tenure. He’s since furthered this reputation with the Rams. Peters leads the NFL in interceptions (20) and pass breakups since 2015. The talented corner has returned three of those interceptions for touchdowns. Peters has also accrued five fumble recoveries through his first three seasons. Peters should have plenty of opportunities to build on his numbers while playing in Wade Phillips’ system. Heyward was flat-out dominant for the Steelers in 2017. The Steelers benefited greatly from Heyward’s breakout season. His 12 sacks led to his first All-Pro and Pro Bowl selections. Not only does Heyward put immense pressure on the QB, but his run-stopping ability is also above-average. Off to another fast start in 2018, Heyward seems intent on being a terror off the edge once again. Berry is the NFL’s ultimate warrior. Having overcome both cancer in 2014 and a torn ACL in 2011, Berry is facing a difficult task coming off a torn Achilles. Easily the best player on Kansas City’s defense, Berry is also an elite safety in the league. A three-time All-Pro and five-time Pro Bowler, Berry picked off four passes and returned two of those for touchdowns in 2016. In addition to being a ball-hawk, Berry is a sure tackler. A healthy Keenan Allen is one of the best receivers in football. Finally playing his first full season as a pro in 2017, Allen torched the AFC to the tune of 102 receptions, 1,393 receiving yards, and six touchdowns. Allen will be the Chargers’ No. 1 option again this season. With tight end Hunter Henry out for the year due to an ACL injury, don’t be surprised if Allen leads the league in targets. The Jaguars hit the jackpot with Bouye. 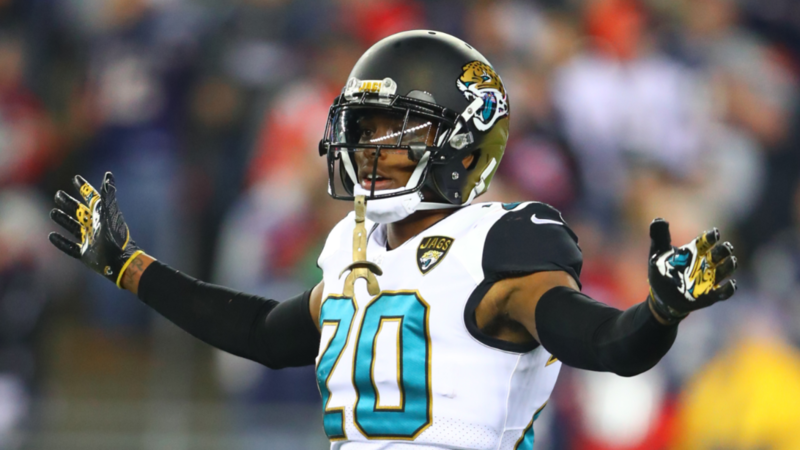 Not only did they poach an elite corner from a division rival (Texans), but Jacksonville added a piece that — combined with Jalen Ramsey — results in one of the best secondaries in all of football. 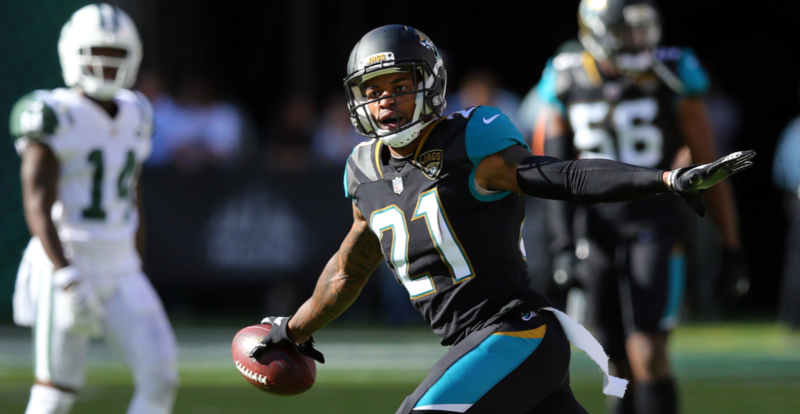 Bouye picked off six passes in his debut season with the Jags. He didn’t allow a single touchdown pass when quarterback’s threw in his direction during the regular season. His staunch play resulted in an NFL-low 33.8 passer rating against Bouye. Green has been an elite receiver in the NFL for years. Green has been named to the Pro Bowl in each of his seven years in the league, and has failed to surpass the 1,000-yard mark only once. With Joe Mixon looking like a solid back thus far, the field should open up a little bit more for Green. The talented wide-out remains a nightmare matchup for most defensive backs even as he turns 30 years of age. Over the past seven years, there have been very few quarterbacks in Stafford’s stratosphere. The Lions franchise player has thrown for more than 4,000 yards in each of the past seven years — racking up 31,947 total yards and 197 TD passes during this time period. 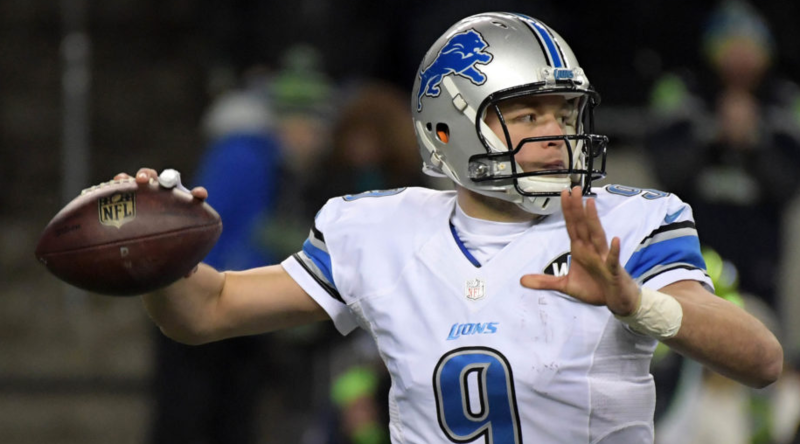 Stafford is coming off a career-high 99.3 quarterback rating in 2017. Without any semblance of a rushing attack for much of his career, it is remarkable Stafford has started 113 straight games given the shots he has taken. The second member of Minnesota’s vaunted defense, Griffen is coming off the best season of his career. 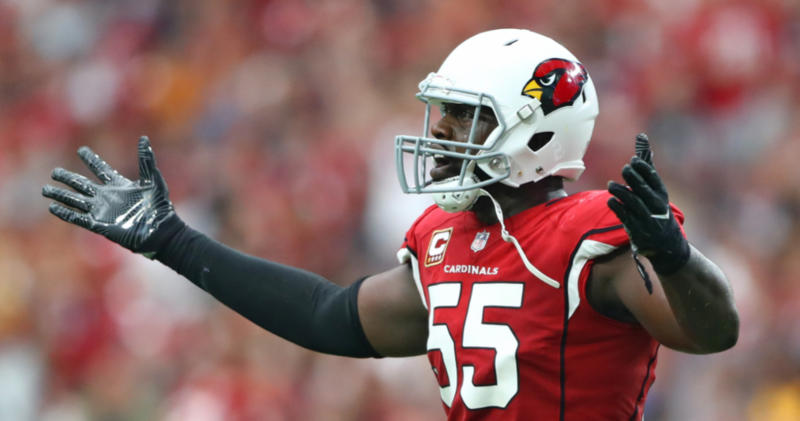 After opening the year with at least one sack in eight straight games, Griffen finished the campaign with a career-high 13.0 sacks and three forced fumbles. Griffen is a dominating force on the field, and a leader in the locker room. A four-year captain, Griffen will have eyes on a fourth Pro Bowl nod this season. 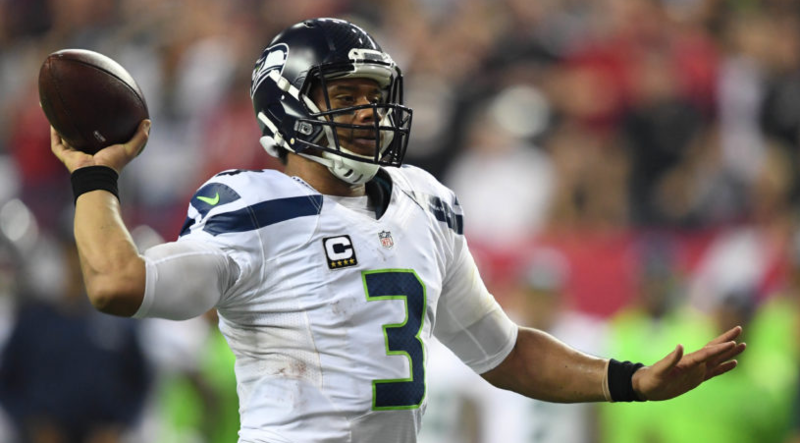 Wagner is one of the lone remaining holdovers from when Seattle’s past defenses ranked among the league’s best. Coming off a year in which he had 133 tackles, two interceptions, and two fumble recoveries, Wagner is in search of his fourth All-Pro selection. Wagner paces the NFL with 522 tackles over the past four years. His aggressiveness is phenomenal — as is his instinctual prowess when shedding blocks in order to make the requisite tackle. When healthy, Smith is the NFL’s best left tackle. His combination of size, strength, and athleticism set him apart from the rest of the top contenders at the position. A two-time All-Pro and five-time Pro Bowler, Smith is crucial to Dak Prescott’s performance. Prescott has proved himself to be a reliable starting QB. However without Smith protecting his blind-side, Prescott would be far less effective. If you want an idea of how talented the Minnesota defense is this season, consider this: Rhodes is the third defensive member to appear thus far within the list…and there are still more to come. Rhodes’ performance in 2017 garnered him his first All-Pro selection. Quarterbacks had little success against the talented corner, as Rhodes only allowed two touchdowns and a 54.7 completion percentage. The former No. 1 overall pick had the best season of his career in 2017. In the absence of J.J. Watt, Clowney absolutely dominated. He became the first AFC player to account for 20-plus tackles for a loss and 20-plus QB hits since 2015. 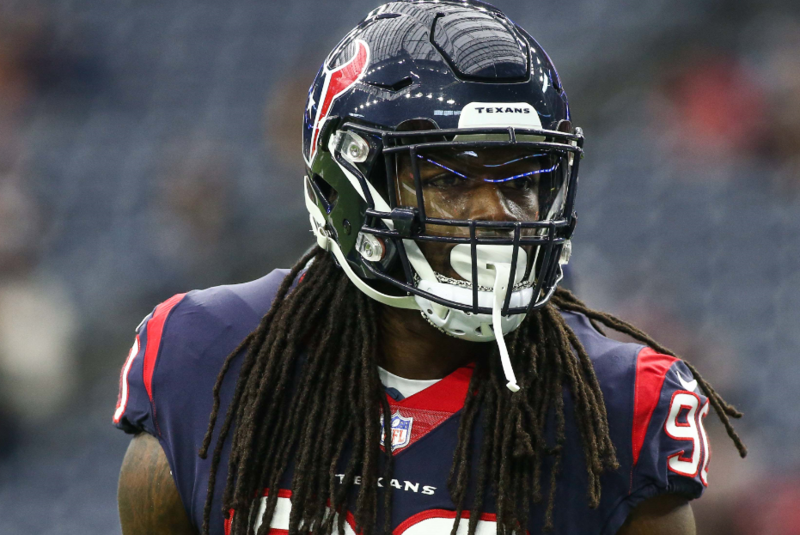 For the first time in his career, Clowney played in every game. If Watt can stay healthy and perform as we’ve become accustomed to, Clowney could possibly have an even greater year than his last. The biggest reason for New Orleans’ turnaround in 2017 was their defense. Jordan is as complete of a defensive end as you will find in the NFL. The uber-athletic pass-rusher earned first-team All-Pro honors after compiling 13 sacks and 17 tackles-for-loss. When you combine that type of production with the next player on our list, you have the foundation of a potentially game-changing defense. You can’t have a much better debut season than the one Marshon Lattimore experienced in 2017. On his way to winning Defensive Rookie of the Year and earning a Pro Bowl nod, Lattimore totaled five interceptions and 18 passes defensed. 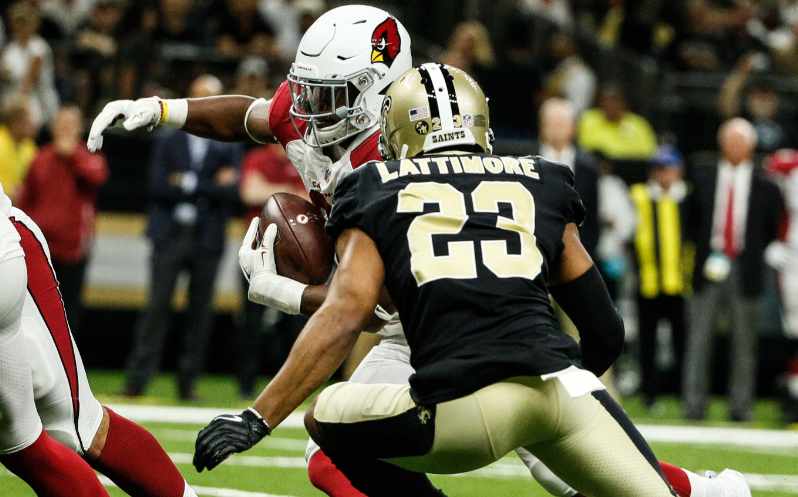 At his current trajectory, Lattimore has a chance to be one of the best corner’s in the NFL for years to come — and possibly the greatest defensive back in Saints history. 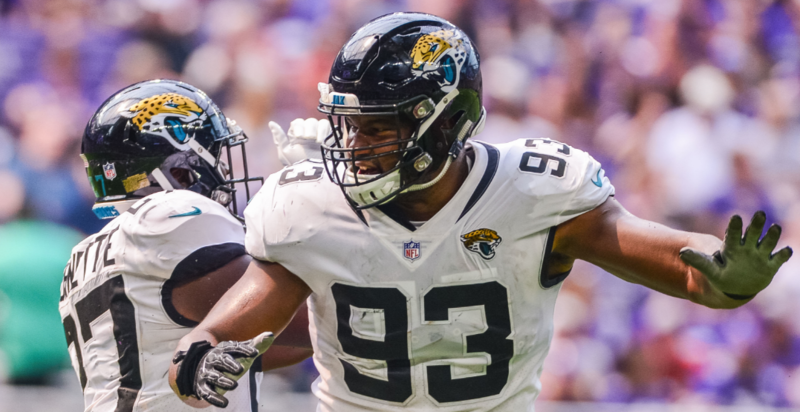 Cox has been an above-average defensive tackle since 2015, but it wasn’t until last year that he became a household name. 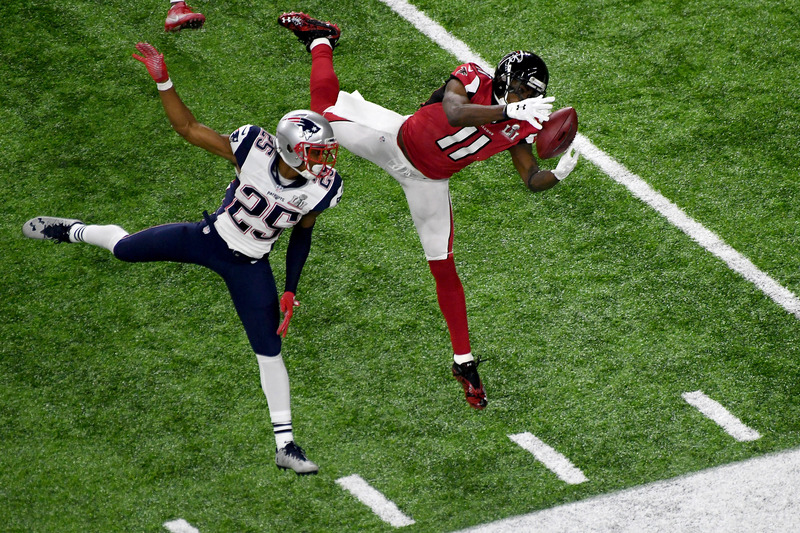 Cox laid eight hits on Tom Brady in the Super Bowl — causing the Patriots line fits all night. With 21.5 sacks since 2015, Cox is tied for fourth among all defensive tackles. 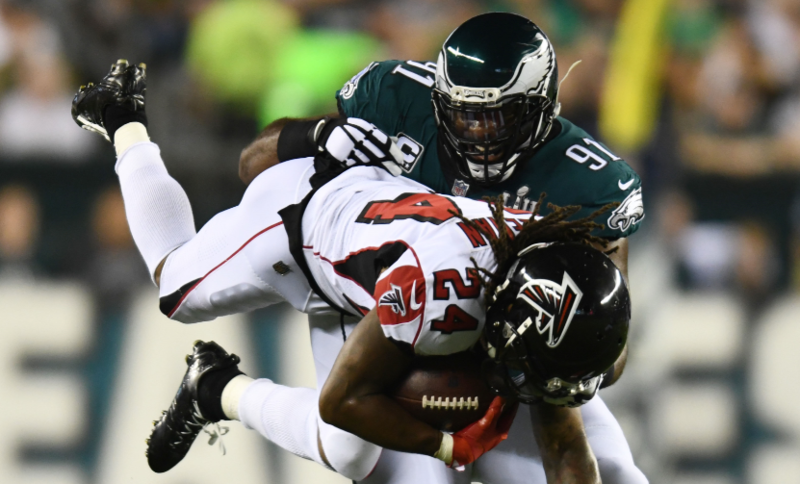 Picking up right where he left off, Cox has already registered his first sack of 2018 in a Week 1 victory over the Falcons. Since entering the league in 2010, Geno Atkins has been an absolute menace. 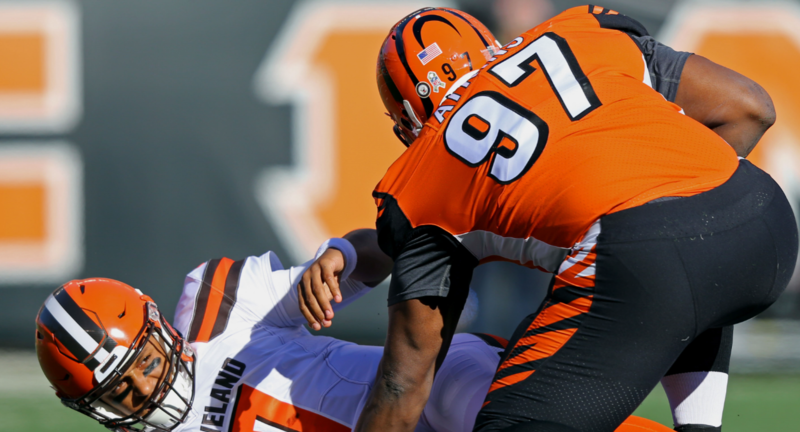 The Bengals best defensive player has two All-Pro and six Pro Bowl nods under his belt. In 2017, Atkins led all DT’s in sacks with 9.0. 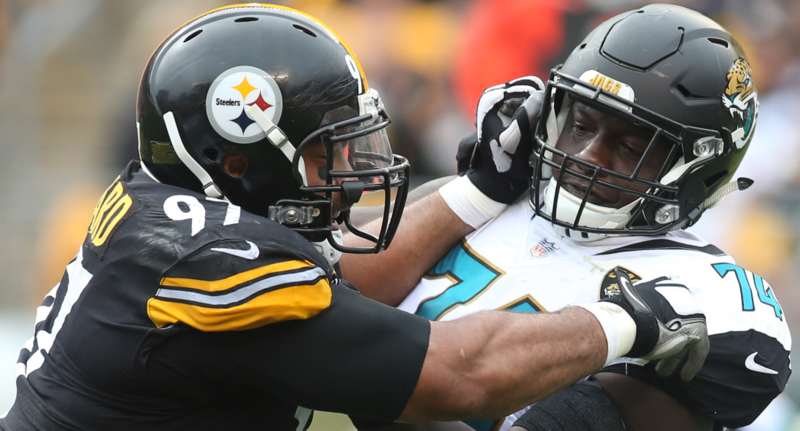 It’s the fifth time in eight years in which he’s led defensive tackles in sacks. Over the past three seasons alone, Atkins has registered 29.0 sacks. After taking down Andrew Luck in Week 1, Atkins is well on his way to another high sack total. The Saints deserve an A+ for their 2017 Draft. Not only did they hit it big with Lattimore, but drafting Kamara was also a home run. Kamara, the 2017 Offensive Rookie of the Year, scored 14 touchdowns and tallied 1,554 yards from scrimmage. He set an NFL record with 7.7 yards per touch as a rookie. 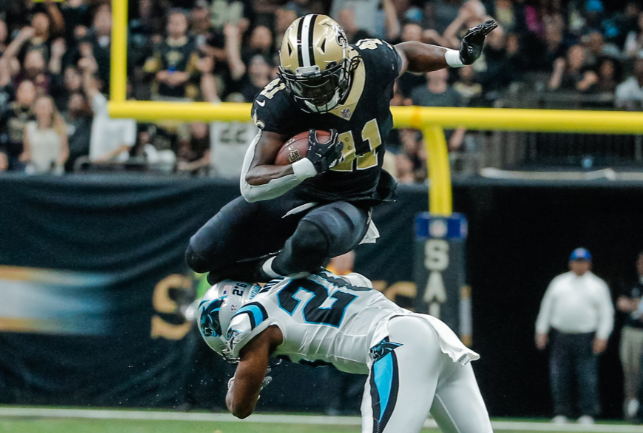 The excellent second-year back totaled 141 yards of offense and three touchdowns in the Saints 2018 opener. Since entering the league in 2010, Thomas immediately entered the ‘best safety in the NFL’ discussion. 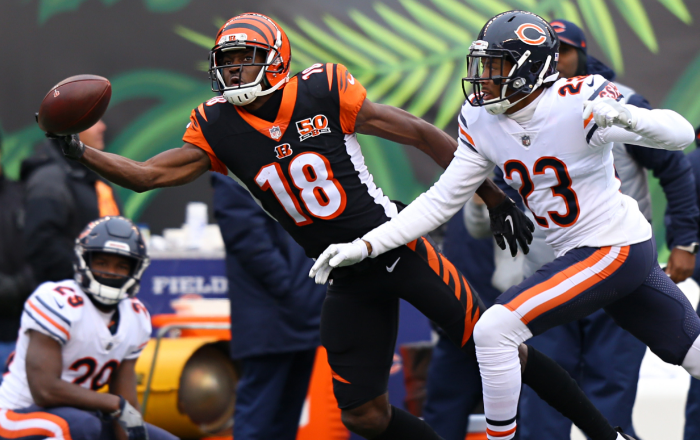 A three-time All-Pro and six-time Pro Bowl selection, Thomas came back with a vengeance after returning from a broken leg suffered late in the 2016 season. Playing in 14 games a season ago, Thomas had 88 tackles, two interceptions, one forced fumble, and six passes defensed. 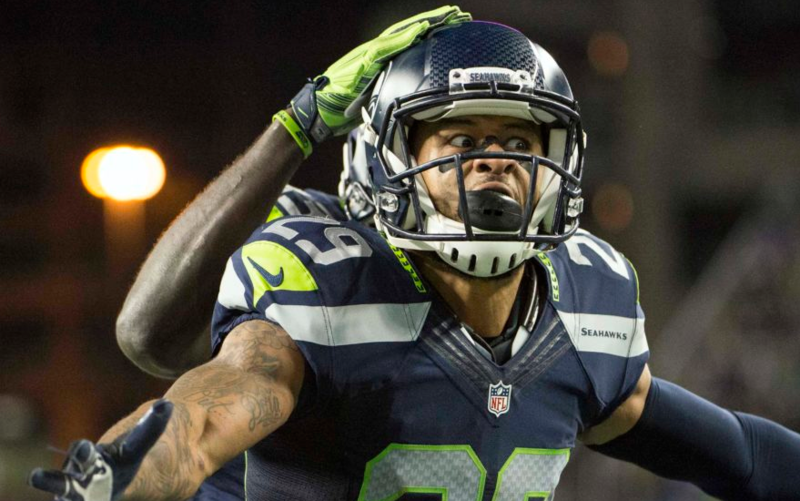 Thomas reported to the Seahawks in time for Week 1 and quickly flashed his brilliance — registering six tackles, one interception, and two passes defensed. 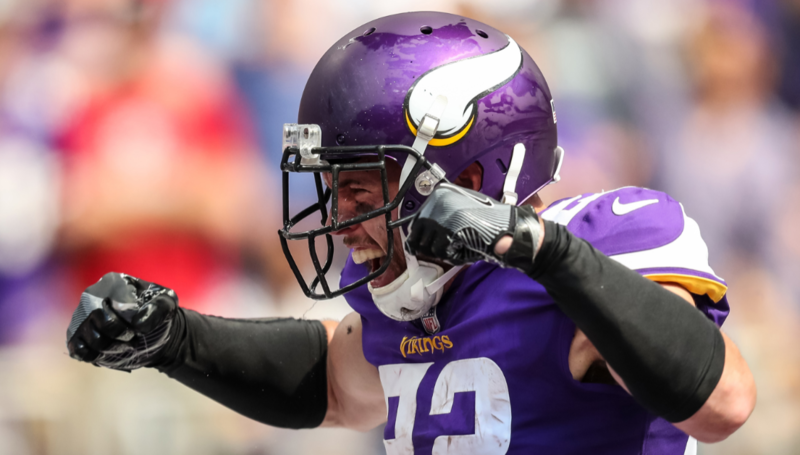 Perhaps the NFL’s best all-around safety, Smith is the fourth and final member of the Minnesota defense to be featured on this list. Smith’s 6-foot-2, 214-pound frame allows him to matchup with bigger receivers and elite tight ends. Smith accumulated 78 tackles, five interceptions, and 12 passes defensed in 2017. These numbers earned him his first All-Pro selection. The No. 2 overall pick in the 2016 NFL Draft, Wentz was having a tremendous season before suffering a serious knee injury late last season. Prior to his injury, the Eagles’ star was among the favorites to take home the MVP. 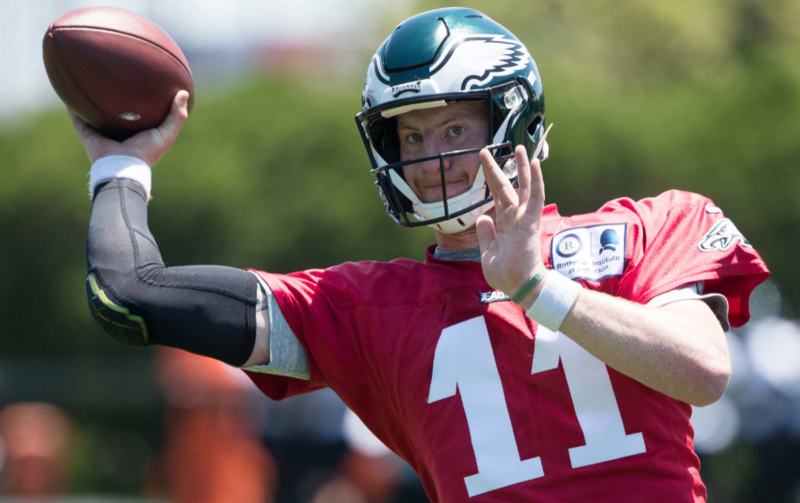 Wentz displayed the arm strength, decision-making, and overall tenacity necessary to succeed as an NFL quarterback. 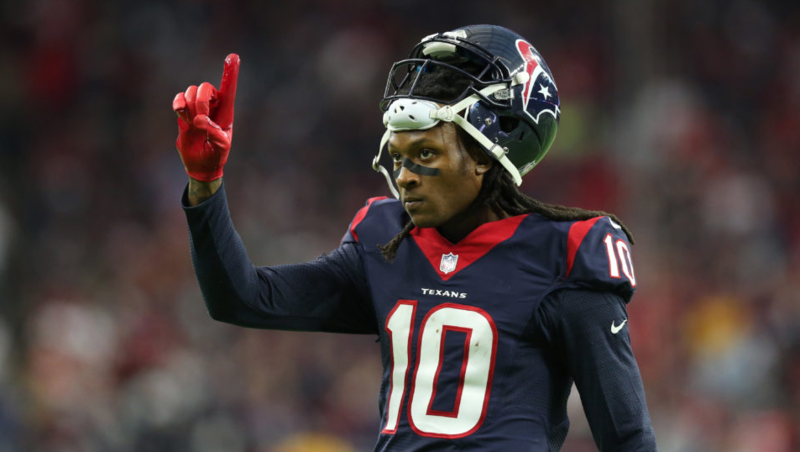 Regardless of the poor quarterback play surrounding him throughout his career, Hopkins has developed into one of the elite pass-catchers in the NFL. Hopkins was named an All-Pro for the first time in 2017 (even while catching passes from three different quarterbacks). The Texans’ main man led the league with 13 touchdown catches — a number that may increase with a full season of Deshaun Watson delivering the passes. 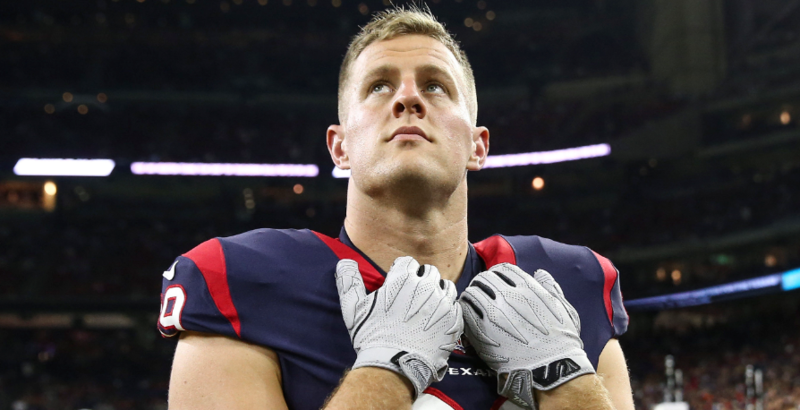 Watt’s scary injury history unfortunately limits his ceiling within this piece. When fully healthy, there’s perhaps not a more dominant force in the NFL. The Wisconsin native will have to prove he can get through the majority of a regular season in order to fully reclaim his presence. In terms of a playing style, Watt pairs country strength with above-average quickness and an unabated desire to obliterate opposing quarterbacks. Kansas City seems to have great fortune when possessing elite-level tight ends. 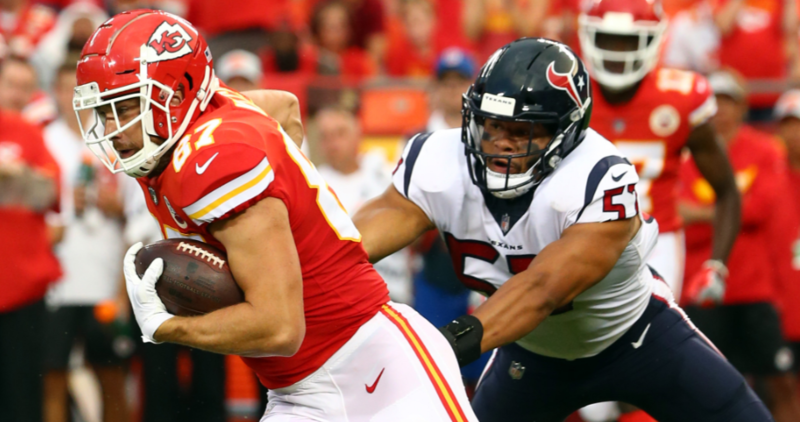 While Tony Gonzalez bears the reputation as the best tight end in Chiefs’ history, Kelce is uber-gifted in his own right. The Ohio native is on a run in which he’s made three-straight Pro Bowl appearances. Kelce gallops downfield with relative ease — making him a major problem for linebackers to defend against. His gigantic frame is also quite effective when fighting smaller defensive backs for the football. In today’s NFL, an every-down back is somewhat rare. More and more teams are employing ‘running back-by-committee’ schemes as opposed to relying upon a single rusher. 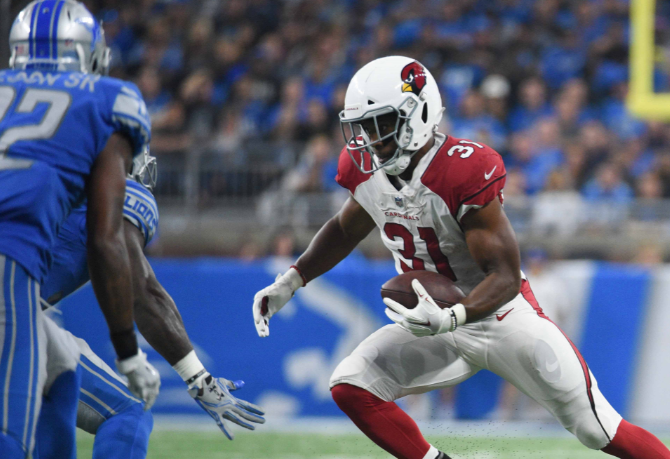 David Johnson has more than proven his worth as a back ready to shoulder the proverbial load. He’s one of the best running backs in terms of catching passes out of the backfield. Duly, Johnson is surprisingly quick for possessing such a large frame. His value to the Arizona Cardinals is understandably quite high. 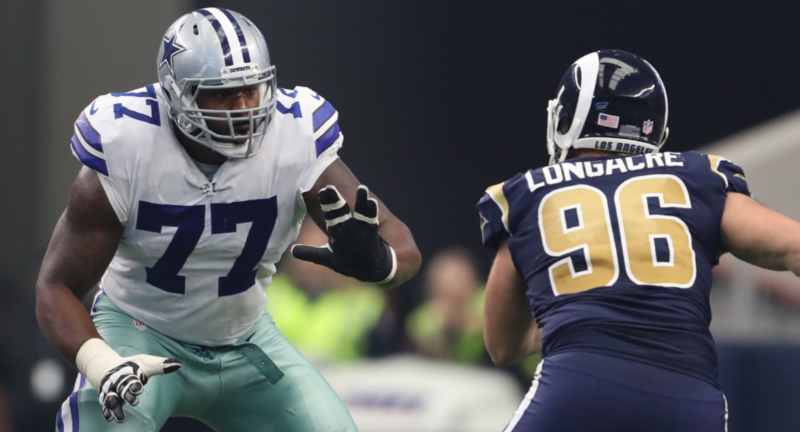 The Cowboys are equipped with one of the best offensive lines in the NFL. 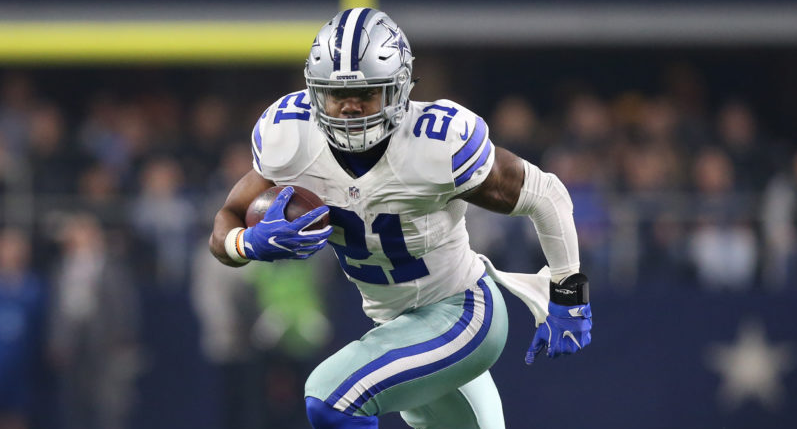 Ezekiel Elliott has more than enjoyed running behind the incredibly impressive unit. Guard Zach Martin is a huge reason for this success. The Notre Dame product is arguably the best interior lineman in all of football. Martin can maul opposing defensive tackles when tasked with run-blocking. He’s also athletic enough to jump to the second level — or even get out on the move when executing a zone-blocking concept. In pass protection, Martin’s strong base enables him to get the requisite balance before latching onto defensive linemen with freakishly strong hands. Without question, Martin is a special player. People don’t realize just how good Russell Wilson is. 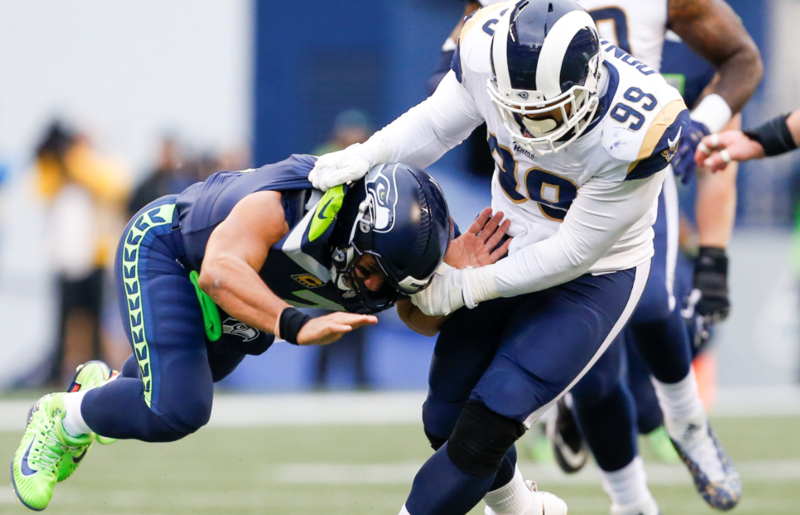 The Seattle Seahawks have done a rather poor job in protecting Wilson — whether it be with an adequate offensive line or a passable run game. Wilson is often running for his life in search of receivers downfield. Even with all the stress, the Virginia native is still putting up monster numbers. The four-time Pro Bowler never seems phased by any semblance of pressure. Wilson calmly goes through his progressions before spraying the ball around the field. If he ever received a halfway decent offensive line/run game, Wilson could put up even greater numbers. 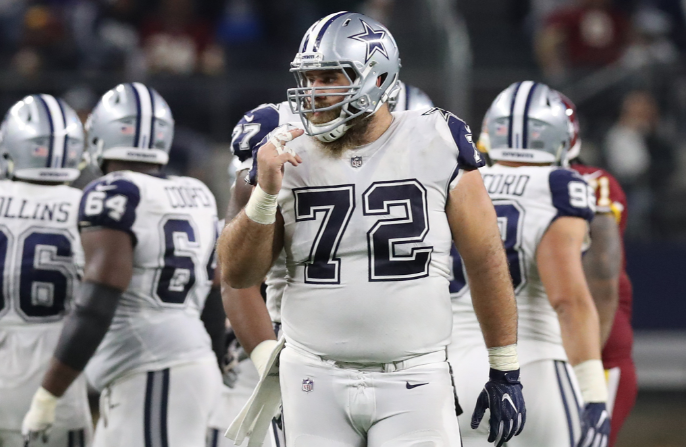 The linchpin of Dallas’ offensive line group is Frederick. Wicked smart and tough as nails, Frederick is responsible for setting the tone up front. He makes all the calls at the line of scrimmage. Resembling a portly quarterback, Frederick is masterful at not only calling out oncoming blitzes, but also making sure everyone is lined up properly. Earlier this year, the four-time Pro Bowler sadly was diagnosed with Guillain–Barré syndrome. It’s unknown as to when Frederick will play again. Bill Belichick surely wishes Jones was back in New England. Since coming to the Cardinals in 2016, Jones has been a dominant player. He’s accrued three-straight years with at least 11.0 sacks — including last year’s effort of 17.0. Jones has the versatility to line up as either a defensive end with his hand in the ground, or a stand up edge rusher. Offenses have a tough time stopping Jones in space — particularly when his positioning on the field is disguised. Jones is without a doubt a premier rusher in today’s game. Jones has established himself as a Hall of Fame-level talent since coming into the league in 2011. The former Alabama star has every trait one would want in a No. 1 receiver. Jones has immensely strong hands, sharp route-running skills, breakaway speed, above-average height for the position, and an instinctual prowess when fighting for the ball in the air. Jones has gone over the 1,000-yard mark on five separate occasions. Barring an injury, he’ll likely get there again for a sixth time in 2018-19. Calais Campbell is an absolute beast. The Colorado native can play inside as a defensive tackle, and also on the edge as a pass-rusher. This seems relatively normal for most playing along the defensive line. However, one also has to factor in that Campbell stands a whopping 6-foot-8. This aspect is disruptive for a number of reasons. Campbell is always a threat to bat down passes at the line of scrimmage (aside from obstructing the view of passers). Additionally, his long wingspan allows for him to latch onto offensive linemen before blowing them backwards into the backfield. When watching Jacksonville games, one can be sure to see Campbell flashing with regularity. Let us focus on Elliott the football player rather than the man with off-field transgressions. There are very few backs in today’s era possessing Elliott’s ability to accelerate. His running style isn’t so much shifty as it is making one cut before exploding downfield. Elliott is fantastic at exploiting small pockets of space crafted by his offensive line. His patience as a rusher has improved — as has his collective vision. There’s no reason to think Elliott can’t run for another 1,000-yard season in 2018. If there’s such thing as the second-coming of J.J. Watt, Bosa would be it. The former Ohio State star has notched double-digit sack totals in each of his first two professional seasons. Bosa plays the game with equal parts intensity and violence. As such, it’s resulted in him already becoming one of the most feared edge rushers in the league. It’s scary to think about how good Bosa will eventually become. He’s only 23 years of age — and has yet to hit his prime as a player. Outside of Tom Brady, there’s not been a more dominant player to take the field at Foxboro. 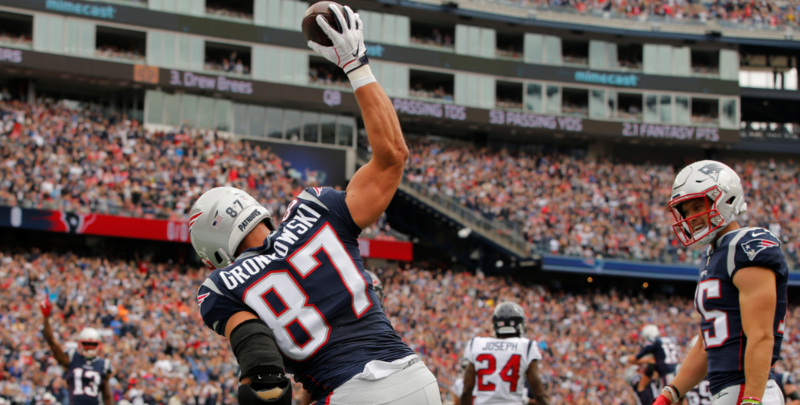 ‘Gronk’ is as physically impressive a tight end as the game has ever seen. He resembles a defensive end more so than a tight end — particularly when factoring in the physicality with which he plays. The middle of the field has been highly good to both Gronkowski and Brady, and will continue to be for as long as Brady is playing. The former Arizona Wildcat cradles the football like a small child’s toy. His impressive set of hands are a massive reason for New England’s sustained success over the last decade. The soon-to-be 24-year-old out of Florida State is a fantastic corner. Ramsey plays with an intelligence far beyond his years. His ability to diagnose routes whilst making the requisite play is truly impressive. Ramsey is equally as good jamming receivers at the line of scrimmage as he is running with them in coverage. It’s getting to a point where opposing teams are hesitant to challenge Ramsey on any shot downfield. Assuming he stays healthy, the third-year player could one day develop into an all-time Jacksonville Jaguars great. While Ramsey is the new guard, Peterson represents the old guard. He continues to be a dominant player within Arizona’s secondary. The 28-year-old has made the Pro Bowl in all seven of his NFL seasons. Rarely do you see a defensive back dominate with both physicality and jaw-dropping athleticism. Usually, good corners have one or the other. In Peterson’s case, he’s equipped with both. 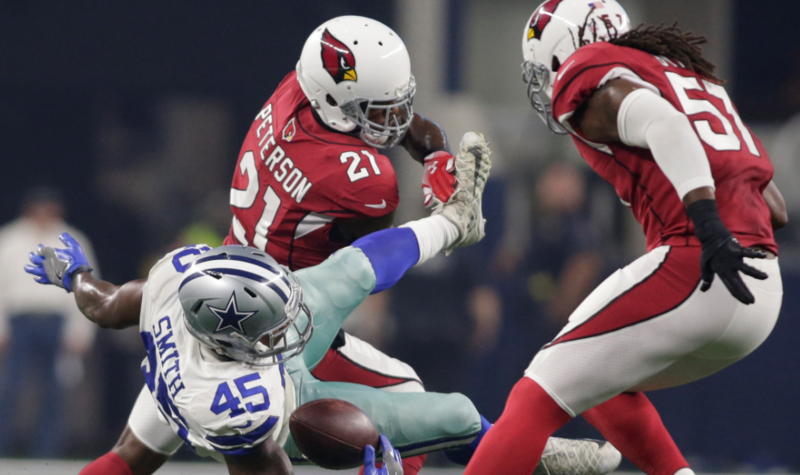 Injuries permitting, one can expect Peterson to continue to play at an all-pro level for the foreseeable future. Kuechly is good for about four injuries per game. He’s also likely good for 10+ tackles, a forced fumble, and a whole lot of pain distributed to receivers, tight ends, and running backs alike. The former Boston College icon plays the game as if his hair were on fire. Some call it reckless, and others call it downright impressive. 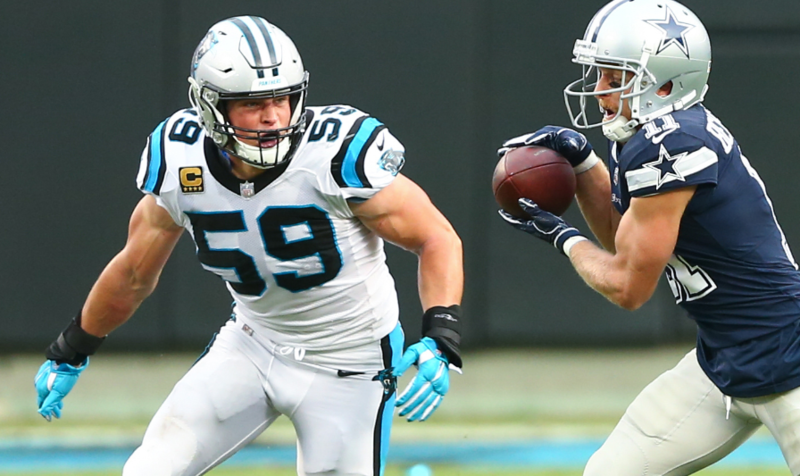 Kuechly has the athletic ability to be an above-average player when stopping the run, as well as when tasked with covering smaller players leaking out of the backfield. Beckham Jr. certainly has a flair for the dramatic. There are times in which his innate talent leaves the audience breathless. There are also other times when Beckham Jr.’s sideline antics leave you shaking your head (in a negative sense). Outside of Antonio Brown, Beckham Jr. makes it look easier than anyone else. He prances around the field akin to a gazelle, and has the leaping ability of a kangaroo. Beckham Jr. is unquestionably an elite talent. We have to rank him solely on that rather than the other less-savory aspects of his complete package. The 39-year-old is still humming along as one of the league’s best quarterbacks. 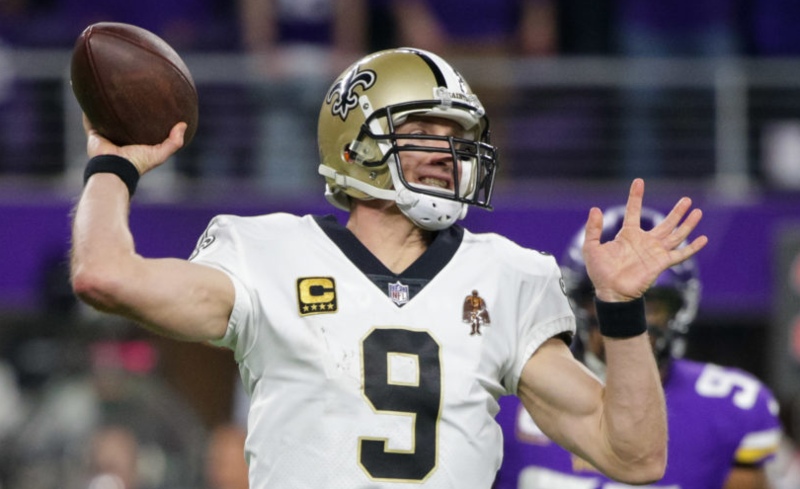 Brees resembles a point guard on the field. He distributes the ball efficiently, and often involves all of his teammates. Additionally, Brees offers pinpoint accuracy on all throws — whether short, intermediate, or launched downfield. His presence within the pocket is also fabulous for a player (generously) listed at 6-feet tall. Brees appears primed for yet another great season. 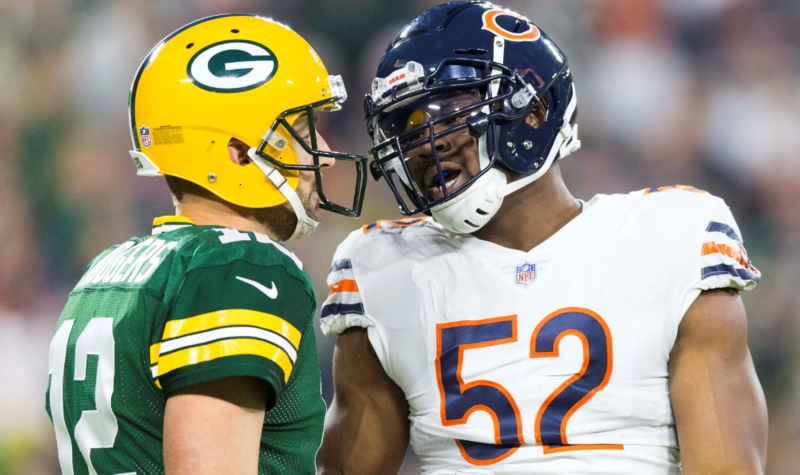 After the season opener versus the Packers, those around the league — and particularly in Chicago — know why the Bears were so dead-set on acquiring the Florida native. Mack can take any game over on a moment’s notice. Physically strong, Mack is exceptional when bull rushing tackles. He’s nimble enough to make plays from the outside linebacker spot. However, Mack’s bread and butter exists when putting his hand in the ground. There are very few defensive players possessing Mack’s ability to get after opposing quarterbacks. From an accolades standpoint, Miller gets the nod over Mack as the league’s most dynamic pass-rushing specialist. No player in the NFL today equals Miller in terms of first-step quickness. It’s often unfair when seeing opposing offensive tackles lunge at Miller like a baby attempting to walk for the first time. He’s a proven commodity in this league — and should be for years to come. Miller is hoping to make his seventh Pro Bowl in 2018-19. Though we don’t yet know what Le’Veon Bell’s status will be for this upcoming season, the rusher out of Michigan State still remains as one of the league’s best players. 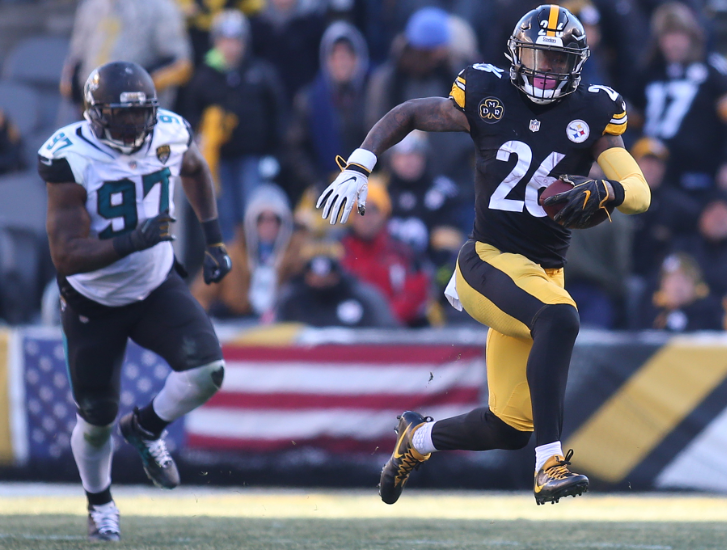 There’s not another running back in football possessing Bell’s patience as a runner. He’ll calmly wait for the lane to materialize before bursting forward for large chunks of yardage. There’s also Bell’s ability to catch passes out of the backfield at an incredibly high rate. It will be fascinating to see how this year unfolds for the All-Pro rusher. Gurley has officially passed Bell as the NFL’s best running back. 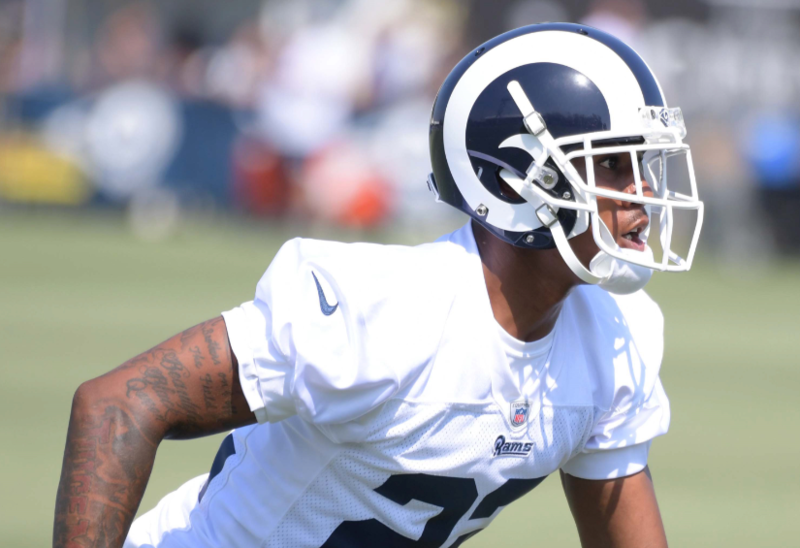 The 24-year-old out of Georgia has Bell’s size — yet much more speed and wiggle. 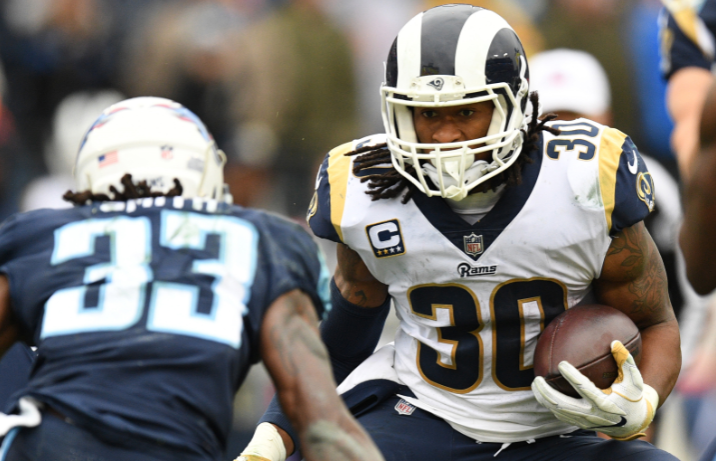 Essentially, Gurley pairs Bell’s frame with the explosive nature of an Elliott or Kamara. The Rams have smartly built its entire offensive scheme around Gurley’s skill-set. Health permitting, he could turn into the league’s most physically dominant running back since the days of prime Adrian Peterson. He’s truly that good. Donald is the most dominant defensive force in all of football. He defies the laws of logic as it pertains to the ‘ideal’ defensive tackle. The Pittsburgh native uses his 6-feet-1, 280-pound frame to his advantage. Donald is able to gain the upper-hand in leverage on virtually every play — particularly in an obvious passing down. His short-area quickness — combined with hand-fighting skills — is unparalleled at the position. 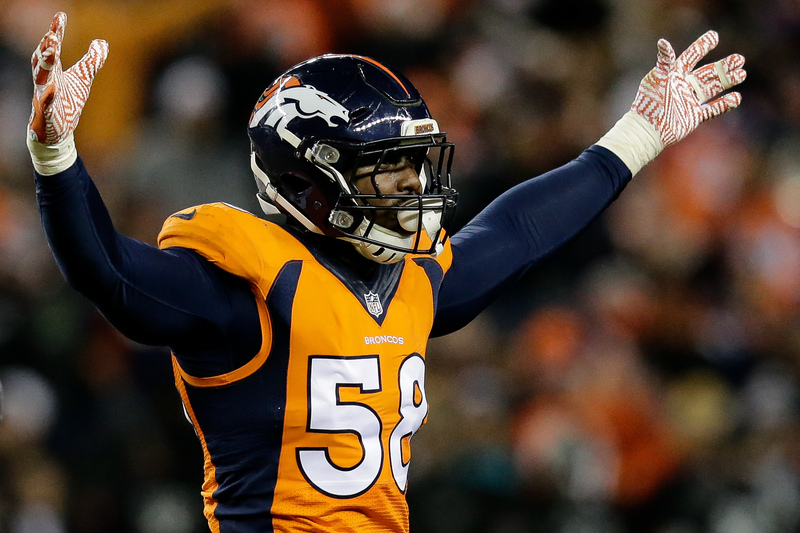 Through his first four seasons, Donald notched a whopping 39.0 sacks. This type of production from an interior lineman is simply mind-boggling. Brady certainly possesses below-average athletic ability when compared to the rest of his peers. He’s not good at scrambling for yardage once the play breaks down. Duly, Brady’s arm strength has been zapped over the last few years. None of this really matters — as the northern California native is without a doubt the greatest signal-caller of all-time. At 41 years old, Brady still can place the ball anywhere he wants. His awareness on the field is fantastic — particularly when being pressured by oncoming blitzes. In a sense, Brady is a grizzled artist. He utilizes a host of graduate-level tricks in order to craft a masterpiece in the form of winning. 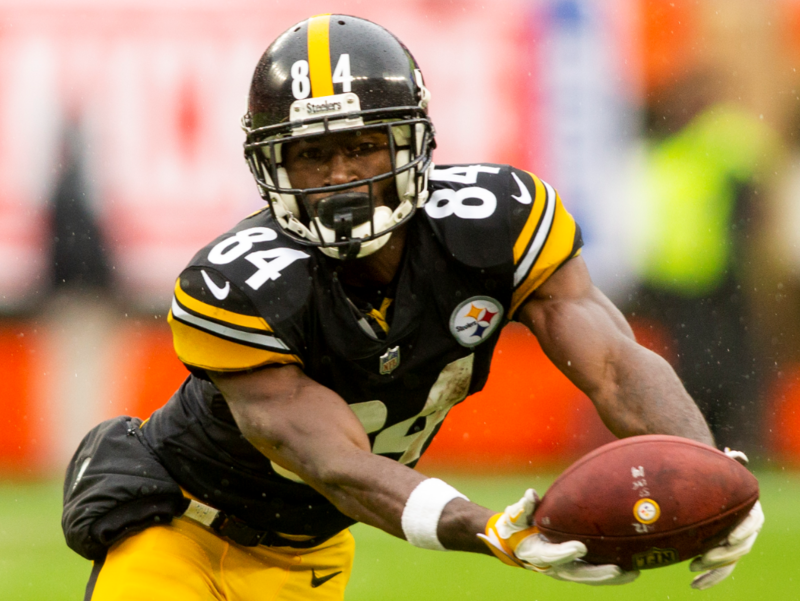 The 30-year-old receiver is an exceptionally gifted pass-catcher. Brown has accrued five-straight seasons with at least 1,200 receiving yards — including a scintillating 1,698 yards during the 2014 season. The Miami native combines elite speed with crisp route-running and an insane catch radius. He plays much bigger than his 5-foot-10 frame would indicate. In terms of consistency, there’s not another receiver in the NFL possessing Brown’s rate of weekly excellence. It doesn’t appear as if he’ll slow down anytime soon. Rodgers grabs the title as being the most gifted football player in the league today. It’s astonishing for the California native to have Green Bay in contention year after year. Without Rodgers on the roster, the Packers might rank as one of the bottom five teams from a talent standpoint. His value/significance to the franchise cannot be overstated enough. 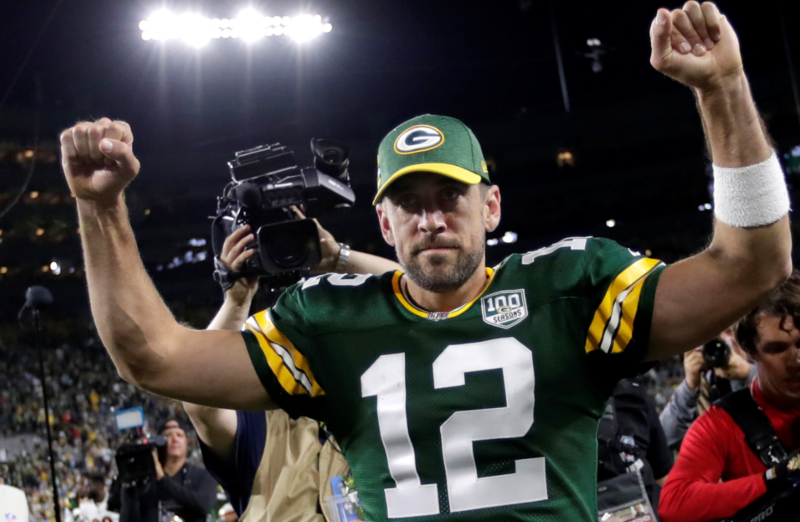 Rodgers has sublime arm strength, surprisingly good mobility, impressive mental acuity, and the wherewithal to make big plays when needed most.